Healthier and Longer Hair – The importance of proteins! 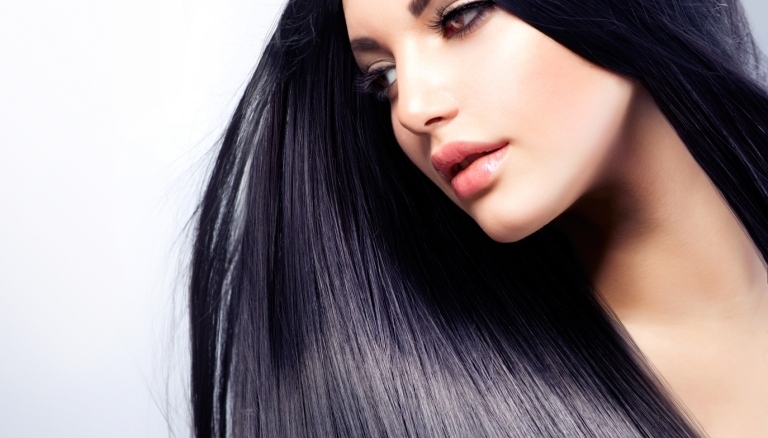 Healthier and Longer Hair – The importance of proteins!!! Home > Blog > Medical Treatment Articles > Healthier and Longer Hair – The importance of proteins!!! There are several things that add to the confidence of a person, and while clothes and the ability to speak well are some of them, a great head of hair is certainly high on the list. However, with the lifestyles we all have these days, hair fall has become an issue for many; but there are methods of having healthy hair, and that too, quite easily. Hair is basically made of keratin and keratin associated proteins. The proteins in our body are made of around 20 aminoacids, out of which 9 are essential aminoacids that need to be obtained through diet. Certain aminoacids like cysteine, methionine, lysine and arginine are more important for hair, forming the major constituents of hair keratin. So a well-balanced diet containing adequate amounts of protein are a must for healthy hair. Hair grows in cycles: Anagen or growing phase, catagen or shedding phase and telogen or resting phase. Inadequate proteins in the diet can lead to more hairs in the resting telogen phase and thus increased fall. Dietary deficiencies are commonly encountered in people with hair fall. Another major reason for hair fall is the so-called crash diets and intensive workouts. Shedding the extra-kilos are good but not at the expense of our skin and hair. It is important to eat the right kind of food that provides all the essential nutrients especially proteins to have healthy hair and skin. While dieting, one should reduce carbs and fats but should not compromise on proteins. A lot of foodstuffs are available which have good amounts of proteins but are low on carbs and fats. Similarly if doing work outs, we should take higher quantities of proteins to meet the daily requirements. US FDA recommends a daily intake of 0.9-1gram/kg body weight for a normal adult. Additional 15-20 grams are needed during pregnancy and lactation. Thus one of the easiest and natural way to have healthy hair is by eating right!! This makes it imperative to understand the protein content and quality of proteins in various food sources. Eggs, fish, lean meat, milk, yoghurt, paneer, beans, lentils, soya, nuts are some of the good sources of protein. 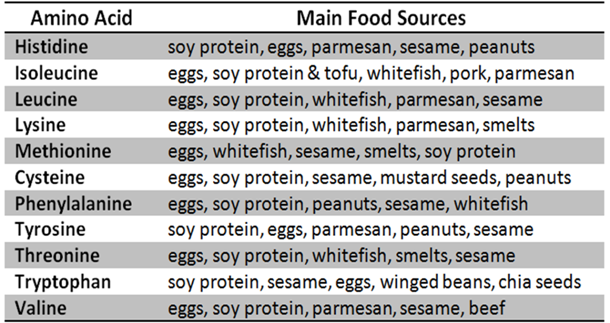 Non-vegetarian sources like eggs, fish provide more complete proteins having all the essential aminoacids than vegetarian foods, which have lower quality proteins. But if you eat the right quantity and include multiple sources rather than relying on a single source, even vegan foods can provide the required quality proteins. 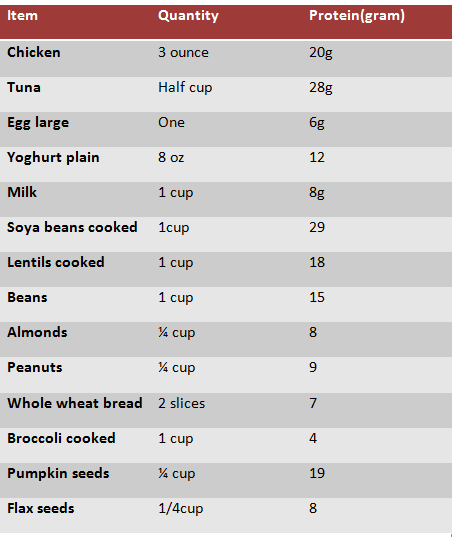 The following table gives an idea about the protein quantities present in various food items. Not only is the right amount of proteins helpful, but the aminoacid constituents also are important. The table below shows the various food items rich in the respective aminoacid. In cases where the dietary requirements are not adequate or if the demand is more like in those who workout, protein supplements can be taken. Various brands are available in the market offering different types of supplements, of which whey protein, casein are the more popular ones. However while taking these supplements, you should always take the help of a professional trainer or a medical practioner so that you don’t get carried away. Too much protein is harmful and can affect your heart and kidneys. Protein packs and Light protein treatments both are suitable for slight damage and routine treatments. Always consult an expert before taking these treatments as to what suits you best!!! Though proteins are definitely important, a well balanced lifestyle with adequate sleep, balanced diet proper exercise and stress management all play a significant role in having great thick hair, beautiful skin and effectively a healthy life. If the hair loss is too severe, there is always the option of transplant and you can be sure of having long and healthy hair for a long time!